“This is the first time a hormone made in the liver has been shown to affect sugar and alcohol preference in mammals,” said Dr. Steven Kliewer, Professor of Molecular Biology and Pharmacology at UT Southwestern and co-senior author of the study, published online today in Cell Metabolism. The hormone – fibroblast growth factor 21, or FGF21 – is associated with environmental stress such as extreme dietary changes or cold temperature exposure. It is also produced when mammals consume carbohydrates. Because of FGF21’s unique effects, forms of the protein are being evaluated as drugs for the treatment of obesity and type 2 diabetes. 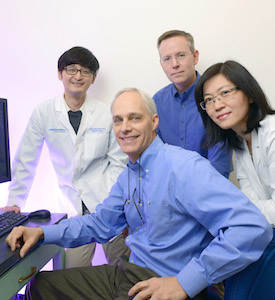 Members of the UTSW research team that found the hormone FGF21 reduced cravings for sweets and alcohol included (l-r) Dr. Parkyong Song, Dr. David Mangelsdorf, Dr. Steven Kliewer, and Dr. Yuan Zhang. “Our findings raise the possibility that FGF21 administration could affect nutrient preference and other reward behaviors in humans, and that the hormone could potentially be used to treat alcoholism,” said Dr. Kliewer, who holds the Nancy B. and Jake L. Hamon Distinguished Chair in Basic Cancer Research. The researchers report that mice with elevated levels of FGF21 showed reduced preference for sweetener- and alcohol-laced water as well as a marked decrease in levels of dopamine, a neurotransmitter that plays a central role in reward behavior. “We found that FGF21 administration markedly reduces sweet and alcohol preference in mice, and sweet preference in larger animal models,” said co-senior author Dr. David Mangelsdorf, Chair of the Department of Pharmacology and a Howard Hughes Medical Institute Investigator, who runs a joint laboratory with Dr. Kliewer. Dr. Mangelsdorf holds the Alfred G. Gilman Distinguished Chair in Pharmacology, and the Raymond and Ellen Willie Distinguished Chair in Molecular Neuropharmacology in Honor of Harold B. Crasilneck, Ph.D.
To confirm that FGF21 acts via a brain pathway, the researchers took advantage of the fact that FGF21 requires the co-receptor β-Klotho in order to function. When FGF21 levels were increased in mice genetically unable to make β-Klotho in the central nervous system, the effect on taste preference disappeared. This marks the fourth study from the Mangelsdorf-Kliewer laboratory to show that FGF21 directly affects the central nervous system. First, in two studies in Nature Medicine in 2013, they reported on FGF21’s ability to regulate metabolism, circadian (body clock) behavior, and female reproduction. In 2014, they reported in Cell Metabolism that FGF21 acts on the brain to cause weight loss. The study was supported by the National Institutes of Health, the Robert A. Welch Foundation, the Sir Henry Dale Fellowship jointly funded by the Wellcome Trust and the Royal Society, the Ford Foundation Fellowship, the German National Science Foundation, and the Howard Hughes Medical Institute. Novo Nordisk provided the recombinant FGF21 used in the experiments. UT Southwestern co-authors from Pharmacology included Dr. Bryn Owen, a former postdoctoral researcher now at Imperial College, London; Dr. Parkyong Song, a postdoctoral researcher; graduate student Genaro Hernandez; Dr. Yuan Zhang, Instructor in Pharmacology; and summer intern William T. Scott. Also contributing was Dr. Hao Tang, Assistant Professor of Clinical Sciences. UT Southwestern collaborated on the study with researchers from Friedrich-Alexander University Erlangen-Nuremberg in Germany, King’s College London in England, and Pfizer in the United States.